Available up to a filtration efficiency of 95% for 10 micron particle size. (Overall filtration efficiency by using discrete particle count efficiency test method). 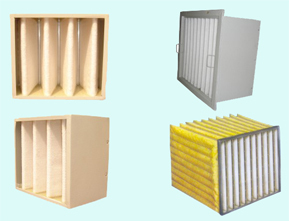 Suitable for use as filter grades G1 to G4 of EN 779 and MERV 1 to 7 of Ashrae 52.2. Can be manufactured with or without "Flange" or "Header". Optional perforated metal or expanded metal guard. Available in casing thickness from 0.5 to 1.5 mm in MOC variants of Galvanized. 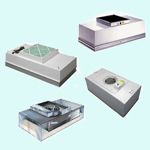 Sheet steel, Aluminium or Stainless steel with suitable surface finish. These are extended surface filters that can be manufactured either in either "Rigid pocket" or "Soft pocket" types to suit the application. Suitable for use as filter grades F5 to F9 of EN779 and MERV 8 to MERV 15 of ASHRAE 52.2.Can be manufactured with or without "Flange" or "Header". Available in casing thickness from 0.5 to 1.5 mm in MOC variants of Galvanized sheet steel, Aluminium or Stainless steel in varying depths of 25, 100, 150, or 300 mm. Suitable surface finish for the casing can be provided. Available up to a filtration efficiency of 99.999% for 0.3 micron particle size. (Overall filtration efficiency by using discrete particle count efficiency test method or by Photometer point to point scan test with PAO / DOP challenge aerosol). Suitable for use as filter grades H13 and H14 of EN1822 and suitable for ISO Class 5 operation as per ISO 14644. Available in casing thickness from 0.5 to 1.5 mm in MOC variants of Galvanized sheet. Steel, Aluminium or Stainless steel with suitable surface finish. Available in standard sizes of 4' x 2', 3' x 2' and 2' x 2' in height of 14". Non standard sizes available on request. Option of SS 304 (or) SS 316 (or) Aluminium (or) Galvanized sheet steel enclosure with suitable surface finish. Option of down stream perforated grille having MOC SS 304 (or) SS 316 (or) Aluminium (or) Galvanized sheet steel with suitable surface finish if needed. 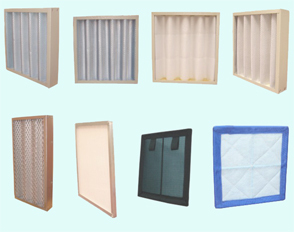 Replaceable H13 or H14 Mini pleat Hepa filter and 5 micron Pre filter. Facility to measure pressure differential across Hepa filter. Suitable for ceiling suspension or for direct fitment on mezzanine floor. 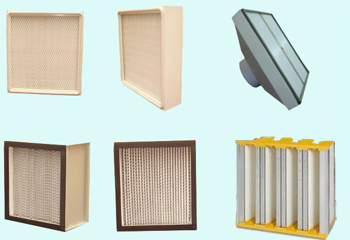 © Copyright 2010 Impec Filters Pvt Ltd.